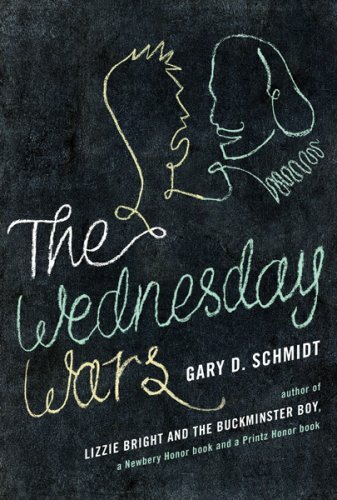 The Wednesday Wars by Gary Schmidt is a great book and I recommend it. It's a young adult book set in New York in the late 60s. Holling Hoodhood doesn't leave school early to go to bible study with the rest of his class so he gets to hang out with his teacher and read Shakespeare. He's so excited! He's not. I love this book. It's really sweet and complicated and deals with all the stuff you deal with in jr. high. I think you'll like it and I think you should read it with your kids if they are 12 and up. I don't want to ruin it, but here's a spoiler. Holling and his buddy meet their baseball idol and he turns out to be a jerk and Holling's friend gives back his signed baseball out of loyalty. It's really moving and good but it's not so sophisticated that it will go over your kids' (or tired adults') head. I believe in the underlying premise of this book, which is that literature enriches our lives because reading it expands our understanding of the human condition. It's a great book. My friend, Amy, gave it to me for my birthday. Here's Amy. I like to think she's reading The Wednesday Wars and thinking, "Kacy would love this." I just finished reading this book and I totally loved it. The next book is called Okay for now and it's about Doug Swieteck who was in The Wednesday Wars. 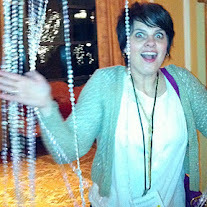 Loved it too. Oooo, I was just looking for a new book. Thanks! Amy has some SWEET patio furniture. Just read The Wednesday Wars and Okay For Now over the summer with my 12-year-old and we both loved them. Both. It's been awhile since I liked a book this much...thanks for the validation. My son read this book first and recommended it to me. I was proud of him for knowing that I would love it just like he did. 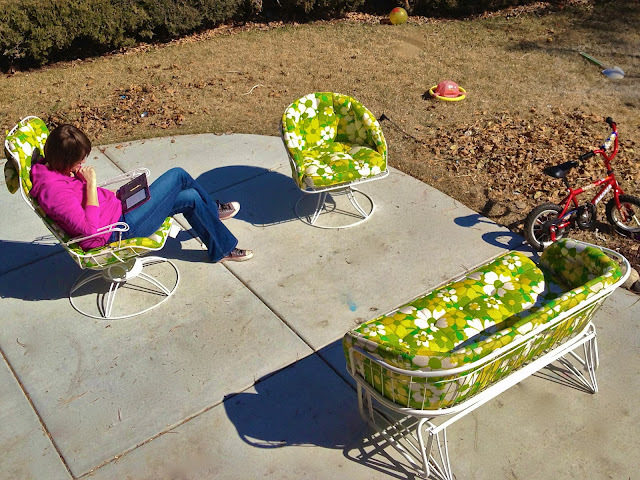 I also love Amy's lawn furniture. Where did she score those beauties?? That was such a great book. Good choice, Amy!! We actually bought that furniture at a vintage shop. It was sitting outside as we drove by in our car and we passed it, looked at each other and did a u-turn to go back and get it. It still had the tags on it from the 60s/70s. Thanks! We love it too! I think we own Okay for Now. I need to read it next.